Advanced Customer Service combines the functions of View Customers and Manual Orders into a single screen designed to make your staff happier and more efficient. Advanced Customer Service (ACS) is the newest Stone Edge add-on from Barney Stone Software. 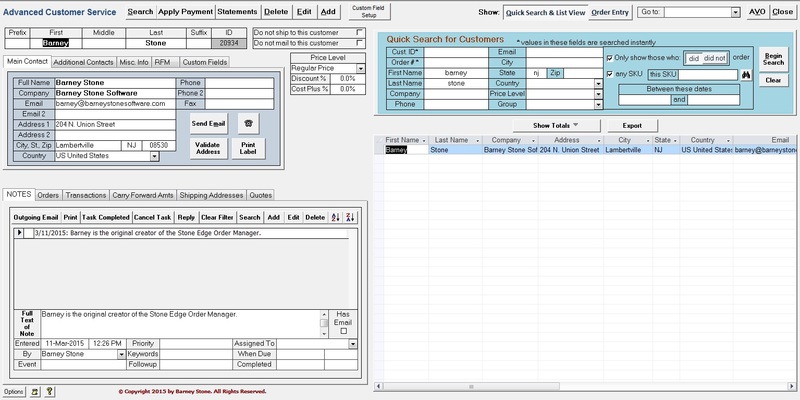 Like Barney’s Advanced View Orders, now used by more than 80 Stone Edge merchants, Advanced Customer Service brings speed, convenience and new features to the Stone Edge Order Manager. Selected customer’s information on the left-hand side. Quick searches, search result list, totals for selected customers and export button on the right. Selected customer’s information on the left-hand side. Stone Edge 5.9 style order entry on the right. • Based on Stone Edge 5.9 design, but with many new features. • Automatically uses available screen space on larger monitors. • Combines View Customers and Manual Orders into a single screen. § Search by Order #, Customer ID, Name, Address, Price Level, Group, etc. § Includes number of orders, amounts for sales, net, shipping, etc. § Copy totals to the Clipboard for use in spreadsheets, emails, etc. • Export – quick and easy export of emails addresses, etc. to text files. • NEW: Grid for fast ordering of items with order options (color, size, etc.)! • NEW: Apply Approval Rules to Manual Orders! Questions, comments or suggestions? Please send them via our Contact Page! ACS requires Microsoft Access 2010 or later and a screen resolution of at least 1600 x 900 (1920 x 1080 or larger recommended). Each user can decide whether to use Advanced Customer Service or the regular View Customer and Manual Order screens, and it only takes a minute or so to switch between the standard and Advanced screens. Advanced Customer Service is available now from Barney Stone Software. The price is $1,000. Owners of our Advanced View Orders product are eligible for a $100 discount on the purchase of Advanced Customer Service. The one fee covers all of the Stone Edge users at your company, and includes a year of support and updates provided by Barney Stone Software. To purchase Advanced Customer Service, please email us via our Contact Page. To view or download the instructions for Advanced Customer Service, Click Here. To see the latest revision history and current version number, Click Here.